Sarojini Naidu, the daughter of Aghorenath Chattopadhyaya, was born on February 13th, 1879. She described her father as a great dreamer and alchemist. "The makers of gold are the makers of verse, they are the twin creators that sway the world's secret desire for mystery and what in my father is the genius of curiosity ..... is in me the desire for beauty." As a leading political figure in India's freedom movement, an orator of distinction, a fighter for women's rights, she still sang her way through life with joyful laughter. With passionate fervour she fought for the freedom of her country and for Hindu-Muslim unity. She was a superb ambassador of Gandhiji and the Indian national movement in her travels at crucial times to East and South Africa, Britain and the United States. Mahatma Gandhi whom she called 'The high priest or honoured guru' of the Satyagraha movement must have been glad of her clear thinking, her integrity and her sense of humour which he shared. As he once said, 'I would love to find that my future army contained a vast preponderance of women over men'. The great depth of friendship, respect and affection between the Mahatma and his devoted disciple, a unique and rare relationship, is brought alive and meaningful in their letters- revealing a side of the great personality that perhaps very few people knew - the Mahatma who writes "Dear Mother, Singer, Guardian of My Soul" and then chides her gently for asking him not to fast. There was a marvelous rapport between them, based on a deep understanding of each other. "It may be that this is my last letter to you. I shall die in the faith that comrades like you, with whom God has blessed me, will continue the work of the country which is also fully the work of humanity in the same spirit in which it was begun." And in the same letter he conveyed two of is most deeply-felt convictions which deserve our constant and complete attention. "If Hinduism is to live, untouchability must die." "If the interests of country are to be one with those of humanity, if the good of the one faith is to be the good of all faiths, it will come only by the strictest adherence to truth and non-violence in thought, world and deed." For me as a child whenever she visited our home, always dressed in bright South Indian sarees, a flower in her hair, talking and laughing with my mother, it was as though a rainbow lit by the sunlight entered the room. It is a privilege to be able to present her correspondence with Gandhiji to the public. 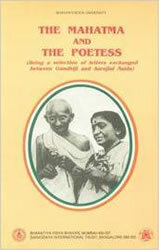 It is sad that much of the correspondence between Sarojini Naidu and Gandhiji has not been preserved. And the text here has several ellipses where words could not be transcribed from the old letters. Yet I trust this collection will shed new light not only on the relationship between two great children of India, but also on their vision and their dedication and most of all on their love for the country and its people for which they made great sacrifices.